"CONGRATULATIONS! You've all been chosen as finalists for our special promotional giveaway!" "Now, you may be all be a little confused, probably thinking along the lines of 'When did I enter this thing?' Well, that decision was never really yours, but try not to worry too much about it and just enjoy the game. After all, for most of you, it's all you'll be doing for the rest of your lives! "Yes, this is one of those exciting interdimensional battles to the death you may have heard about. One, that's right, one lucky winner will walk away with their own life - unless something CRAAAAZY happens in the battle, of course, which is always good for ratings - and our GRAND PRIZE! "Which is, of course, top secret. You want to know what it is? Win the battle and you'll find out! "Before we go further, let's meet our contestants. First, we've got a pack of wolves! Ten of them, to be exact. This is the High Pine Pack, and they're no ordinary wolves... they've got INCREDIBLE PSYCHIC POWERS! Well, incredible for wolves, anyways. They act as a hivemind, and they're pretty intelligent. Oh, and they all count as one contestant; if you want to win, you'll need to beat all ten of them first! "Our next lucky competitor is Hicks! He can change his shape, because he's made out of clay. But this is no ordinary clay... It's explosive! If he doesn't make it through to the end, he's definitely going out with a BANG! "Up next, we've got the incredible Zyl and Janet! This isn't a tag team - this odd couple consists of a worm and the human woman he uses for an arm! We can't wait to see what kind of wacky antics they have in store for us! "And last, but not least, the Oracle of Meow! She may look like an ordinary grey cat to you, but appearances can be deceiving, folks! You see, this cat has an entire religion devoted to her, because she can reveal the future! If anyone knows who's winning this contest before it starts, it's her! "Anyhow, the rules are simple: There are no rules! Not that you guys can really go breaking, anyways. Each round, we'll send you all to an exciting locale, and once one of you dies, everyone else will move on to the next round! "There's four of you, even if you technically have more bodies and personalities than that between you, so that means three action-packed rounds in all. In case you have trouble with math. "As previously stated, our winner will receive an all-expenses paid trip back to their homeworld, and our FABULOUS GRAND PRIZE! Runners-up will receive a one-way all-expenses paid trip to the afterlives, if any, of their respective homeworlds. No refunds, refusals, or replacements are available." The four generated characters suddenly found themselves moved through space, materializing in various locations around a well-furnished restaurant. Wall-mounted cameras watched their every movement, and armed guards stood by at every door. "Welcome to Chateau Securise! This restaurant is renowned for two things - its high-quality cuisine, and its extensive security precautions. The owners have never actually explained exactly why they have so much security here; most people simply assume they're that protective of their special recipes, but rumor has it they're cooking up something else in that kitchen of theirs. Who can say for sure? Maybe you'll find out today! "That's all you need to know. From here on out, you're all on your own. Good luck, and may the best being or pack of wolves win!" High Pine Pack and Hicks were submitted to me by PM. Description: The High Pine Pack is quite simply, a pack of ten wolves. Psychic wolves, to be exact. They are linked under one hive mind, that of the alpha male. The pack as a whole is capable of thinking for itself, and all the wolves can speak simultaneously. However, the wolves still retain a sense of individuality, and each of them can think for themselves if they need to, but they never actually do so unless they are split from their pack. One can say that they have one mind for each wolf, and one comprehensive hive mind. Naturally, the hive mind takes complete authority. Other than this psychic quirk, the wolves look like completely ordinary Grey Wolves, but if you look in their eyes, you can see a strong sense of sapience, and there is completely no doubt that these are not ordinary wolves. Items/Abilities: The High Pine Pack functions as a highly territorial pack of wolves, but they are extremely efficient. Messages can be transmitted instantly, thanks to their telepathic powers. Should they deign to allow another mind into their link, they can send messages to this foreigner as well. The hive mind is directly commanded to the alpha male, and if any wolf strays out of a 50-feet radius, he or she is temporarily unlinked with the hive mind, which can be thoroughly disconcerting for them. They are still capable of thinking and carrying out tasks, however, so they do use this tactic, if only rarely. Biography: In an alternate universe, wolves have become the dominant species of Earth, not humans. Technology never got developed past the tribal stage, and the landscape is dominated by bloody strifes over territory. In this tragic dystopia, one pack managed to survive over the rest of the packs. This pack's power arised from a rare mutation in a single pup. This pup found he had the ability to truly become linked with another, and become one with them. He kept this power secret, and killed anyone who accidentally knew of his powers. He strove to be as completely generic as possible, so it came as a shock for many when he challenged the alpha male for the position in the hierarchy before he even became an adult. He was derided for his brashness, but the challenge was on. Come the day of the duel, he fought his hardest, but he was beaten unconscious. The alpha's victory was assured. But nobody could ever explain what happened afterwards. The alpha male suddenly ran off from the pack and jumped off a cliff, killing himself. The pack fell into chaos, but not for long. The challenger finally awoke, and extended his consciousness to the rest of the pack. The riot was instantly subdued, and from that day onwards, the High Pine Pack has always operated under one mind. Description: Consistently a brown clay color this morphling usually appears as a bald human child. Layers of malleable clay cover him in a faux clothing manner. Appears to be about 13 years old. Nose and ears would not lead anywhere if you looked inside them, and his eyes are globes of translucent goo. If currently experimenting the areas hosting said experiment are known to tint in colour. Hicks remains aloof at all times similar to an animal surrounded by predators. Extended exposure to risks burns him out easily and makes him lose more than just his focus. He is exceptionally clumsy however, and has little physical skill in any way. His attempts at running ,throwing or fighting have never been anywhere near successful, making his creed about troublesome situations be "Don't be there in the first place"
Abilities: Hicks is very malleable. While he can could convert his clay into a sturdier sort the weight effect on the rest of his body would cause him to become structurally unstable and more liable to falling over. His clay at its most basic form is always volatile, his power to reduce this is to simply become a type of explosive that does not react to force or other such stimuli. He can reshape himself at will albeit slowly and the further away from being his natural state the less effective or dexterous he will become. He is not at all good at mimicking human faces and so always defaults to his own looks. Apart from solid or malleable clay Hicks can create the properties of sludge, and is usually leaving small footprints of mildly volatile goo wherever he walks. It would take a spark or significant increase in heat to cause them to react however. As stated earlier he is constantly experimenting oh substances inside his body cavity. Several organs create and modify explosive types, sometimes causing failures that need to be ejected quickly. Background: Originally a child slave Hicks went by another name, one he has long forgotten. He was purchased by a London based alchemist who owned numerous other test subjects. The boy was branded with the letter H and the Latin numeral IX and spent years undergoing horrific experimentation that broke his mind and body several times over. Eventually the alchemist got something right, but didn't understand what Hicks had become at all. Leaving the pile of sludge alone for too long caused a massive build up of explosives and potent gasses that naturally detonated, levelling the laboratory. A small test sample of Hicks survived in a safe, eventually forcing itself out and regenerating into the form he has now using a photo of the alchemists son as a reference for a human form. He became isolated, not needing the comforts or intakes of regular humans he spent months attempting to overcome his volatile disposition. 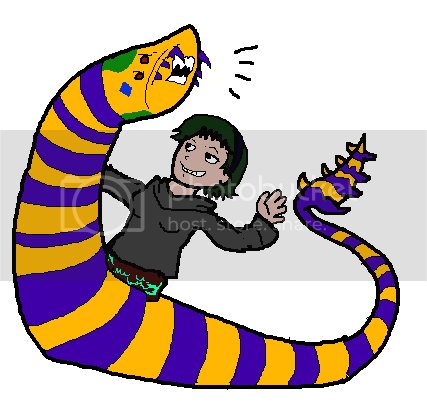 Items/Abilities: In addition to Zyl's FANTASTIC WORM ABILITIES (MACE TAIL! CHOMPY BITES! PRETTY GOOD AT TRAVELING THROUGH WATER! ), Janet provides two hands, each with opposable thumbs (pretty useful). They're also both pretty good at bluffing. Description: The Oracle of Meow is an adorable kitty with smoke-grey fur, the same shade of the smoke that erupts from the volcanic fissures in her temple. She likes scritchies behind the ears and the occasional mouse dipped in honey. Weapons and Abilities: The Oracle of Meow is sentient, and can communicate telepathically - but while she can speak, she can only speak the future. She also is a cat, which is a weapon and ability all in itself. Biography: The Oracle of Meow was a very special kitten. When it was found out that she could speak the future, she got her own temple and a whole lot of priestesses and honey mice every day. It was the life that all kitties deserve. And then she disappeared. The Oracle stretched, hindquarters in the air, and looked around with that irritating confidence cats have when they’re somewhere they shouldn’t be. She was curled up on a table. Of course, she knew this was going to happen, down to the annoying disembodied presenter’s overenthusiastic voice; she’d kept a mouse in her paws up until the very end. Om nom nom nom. Now, though, the future was getting kind of fuzzy. That was a bit alarming, though not unexpected. Maybe being transported made the mice go funny, or perhaps this was the quantum at work. She’d foreseen a horrible quantum accident once, and it ended up not happening because she’d foreseen the outcome – she’d had to lock herself up in a box with a rock of pitchblende, a Geiger counter and a bottle of cyanide for a whole minute before the wavefunctions deigned to collapse. She sniffed indignantly. Cats shouldn’t be beholden to wavefunctions. Carefully, she rolled over on her back, dimpling the tablecloth under her, and watched the ceiling cameras with narrowed eyes. Now, where were the others? There was a chew toy, a human and a…snake? Tied together with yarn? And the wolf pack. Dogs, she said to herself, spitting out the word. Lithely, grey fur twisted into a sitting position, and the Oracle was facing a waiter that looked trained in assault weapons, and inexplicably at the same time, French. You’re going to ask me a question. she managed, pretending not to notice the Kalashnikov slung casually across his back. The Oracle of Meow licked a paw. I’m going to order the halibut. A blurry image of the future coalesced on her mind like snow. And a dish of cream. And within the next hour or so, three armed men are going to try and take the restaurant. I’m not going to tell you what happens next. Lightly, she jumped down from the table and onto the carpet, and rubbed against the waiter’s legs. Now I’m going to ask you where your litter box is. Aw! You’re not going to try and supersede my precognition again, boy. Carefully, the Oracle of Meow padded off between the tables. You won’t forget that until an hour or so from now, she called back. Any ordinary wolf pack would be accustomed to dealing with unexpected situations. However, this was clearly not an ordinary wolf pack. During their teleportation and the subsequent destroying of the time-space continuum, the neural connections between wolves became frayed, and disconnected for approximately 1.37 nanoseconds. This was enough to relax the Alpha’s iron grip on their minds, although he was unaware of it, the change being so minute. Upon arrival to the restaurant, the wolves were dispersed throughout a roomy, comfortable dining area. They were on top of tables for some reason. Instantly, the Alpha sent various calls to his packmates. My wolves, we have gotten caught in an unusual situation. Remain calm. Do not worry. I will get us all out of this. I need you to follow my orders. Yes, Alpha, every other wolf replied. We are dealing with powers beyond my recognition. It seems that this being is another predator, so we must tread with caution. We have, however, been presented with 3 new prey. If they are all killed, we will be able to escape, and secure our territory in the High Pines. Do you understand? First, we must declare this area our territory. You two males, go and mark our territory. Report back here when our boundaries have been established. Yes, Alpha, the two replied. They swiftly left their tables and carried out their mission. Alpha, the Beta female said. May I ask you a question? Make it quick. Mobilization is our highest priority here. Just where are we? I can see neither the sun nor the moon, but I see many false lights. We will need information, yes. I’m sure you can smell, alongside our prey, many other inhabitants. A few are trespassing our prospective territory. You two, I will need you to drive them out. Once they cooperate with us, inform me and I will be right over to interrogate them. Yes, Alpha, they said, and departed. The Alpha’s commands were rather rudely interrupted by a creature with black-and-white markings, and a black metal thing of some sort on his back. The Alpha only growled a threat at him. This was an invader, and it had the gall to speak to him without cue. It would die. We have an invader. Those who do not have missions, back me up. The Alpha leaped. The waiter seemed to expect this. He quickly armed himself with the Kalashnikov and fired a warning shot. Instantly, the leap was interrupted, and the Alpha tumbled back to the ground, whining at the loud noise. Hold, everybody. Do not approach me. This creature is dangerous. I am fine, but I will need to make a backup plan. Be on guard. The Alpha snapped at him threateningly, but climbed back up and sat awkwardly at the seats that were clearly not designed for wolves. He wanted so badly to kill this arrogant intruder, but he would have to submit for now. He reached out to the waiter’s mind, and inquired. What is the meaning of this intrusion? What do you desire from me? Food? You just give away your prey? That’s absurd! I… will have 10 rabbits. Bring them here right away. It can be said that being an organism that could explode at any moment, death is never far from Hicks' mind. He had postulated his time would be short on his world and even imagined many different ways in which he would die. A fight to the death was somewhere between somehow regaining the ability to sneeze and being kicked in his non-existent gonads by a scorned female. Being mauled by wolves was another, though quite farther down the list. He was not at all shocked by his situation, when even the smallest things could lead to life threatening ordeals you tend to take things one step at a time, and always very carefully. While ignoring the long term implications of the battle, the new location had the very distinct smell of gunpowder. This was, to Hicks, the most pressing issue at hand. While the staff could handle telepathic animals suddenly existing out of the blue, an unidentified bipedal intruder rang a few more bells. Two bouncers quickly took charge of the situation and attempted to apprehend the unwanted arrival. All it took was one word, "Bomb", and the guards halted in their tracks. This is, after all, an experienced legitimate business. "I am a bomb. Me. Whole body. Please, try not to touch." The two guards just stood silently, not moving a muscle. Hicks was impressed, they didn't even flinch. Making bomb threats be non-threatening wasn't easy. A waiter soon arrived with a drinks menu, so to just play along with the situation Hicks asked for a pitcher of iced water. He didn't want anything he was expected to pay for. Hicks could feel several pairs of eyes following him. Whether it was his odd appearance or his odd appearance that sparked their interest wasn't something he could deduce. Along with his pitcher of iced water and, detestably, lemon floating awkwardly in the cool liquid someone who looked important decided to follow. The kind of woman who just ignores everyone that couldn't possibly hold her interest for more than three seconds. So, probably second or third in command by Hicks' standards. "Kellar, a pleasure to meet you mister...?" She extended her hand with the introduction, an act Hicks did not see to return. If she was put off she showed so sign of it, instead beckoning to a side table that looked relatively far from other patrons. After deciding to follow her, she offered him a seat, again not put off by his silent refusal, and stood by while two glasses of water were poured for them. "I hear that you gave some of our staff a little cause for alarm with your introduction. Forgive us for the rude treatment, as you can see our staff need to be on constant vigilance for any signs of trouble. We're also expecting some interesting company later, so security is extra cautious right now." "Hicks. All you need to know is I'm here with whatever other strange magical seeming animals, and some freak, that also just appeared here. Well, not with, just forcibly accompanying for the time being. But, as I told your goons, I'm a living bomb. I don't intend to explode at any time soon, so don't worry. So long as I'm not disturbed I'll be out of your hair without trouble." She barely paused before asking "And if you are disturbed?" "Then you, myself and anyone in the near vicinity is in for a world of hurt. For an instant at least." In this battle of the nonchalant it was the staff that broke first. Displeasure soured her pretty face for a split second, and Hicks took that moment to reach into the glass and absorb both the water and the ice into a clay box that grew from the side of his arm. His mind blanked out as unexplainable biology took place. Gases were parted from water molecules, something not even most scientific figures from his time had yet to understand. But he had gained more fuel for his experiments, and Kellar was even more put off now than ever. But a moment later and her coy smile reappeared like nothing at all had happened. The gleam in her eyes sparked an interest in Hicks, one he'd never felt before. Genuine curiosity in another living being. "Fascinating. Tell me, would you like a tour? I'm sure you'd find what services we have to offer positively... thrilling." By the time Zylkorabon had managed to stop staring into space, Janet was already tearing into a third roll. Through a full mouth, she managed to enunciate "glad you're still with us, Zyl. What are you up to this time?" The worm glared at her. "And what, precisely, makes you think this is my doing?" Janet responded by staring indifferently at him while silently chewing. "Oh, come on, Janet! Like I'd enter us in a battle to the death a third time!" Janet mumbled a "whatever you say" before finishing off the bread and leaning into Zyl. "So there's a bunch of security, and wolves, and a guy made of clay." "Oh, yes, I nearly forgot." She smirked. "Whatever will we do about a clairvoyant kitten? Truly, Zylkorabon, we're ever so doomed if we don't take care of her as soon as possible." The worm turned away, grumbling. "Just thought it was worth mentioning." "Yeah, well, what's your plan for getting us into the kitchen?" Zyl blinked and whipped back around to face his arm. "Excuse me? You want to go into the heavily-guarded area when we already have to worry about three others?" "Well, not really, but there's two things. One, you're going to drag me there eventually one way or the other. And two, I'm pretty sure that as soon as those guys have all eaten-" at this, she waved at the table for ten- "they aren't going to wait too long before their next meal, if you get my drift." "Not to burst your bubble, but I'm going to need some time to mull this over first." He glanced around for an unoccupied waiter and shifted up and down a bit. "Can you, like, flail around a bit? I need to wave him over." Janet sighed and half-heartedly wiggled back and forth. This was going to be a long day. As the waiter walked away, Alpha sent out a communication. Stuck at table, they're onto me. Horde of rabbits brought to table, come take rabbits and go, one at a time. It was demeaning to accept the offer of prey, but they were having a hard time finding prey before coming to the battle. They had overhunted, and were about to move to a different region. The irony in that statement was palpable, yes, but the point was he was not about to turn down free prey. The rest of you, begin approaching the other competitors. We will have to practice... diplomacy. Diplomacy, sir? The Beta female said, as she jumped up to join the Alpha in a meal. Yes. This may be a totally new situation, but at least these people are capable of talking and rational thinking. We will subvert the situation eventually. For now... we rest. Elsewhere, the pair of wolves sent to mark the territory were busily doing so on random stuff, when a waiter came up to them. They growled and raised their hackles. To this the waiter replied with a simple "The bathroom is over that way, sirs." They did not know what a bathroom was, but they decided to follow where he was pointing anyways, as it was another place to mark. As they got closer, however, the smells of conflicting territories became pungent. I will stay back for safety. The wolf leading the investigation headed further into the cloud of smells, and his fur raised at end automatically. His instincts were driving him crazy, and Alpha sent a pre-emptive warning. Calm down. Do not let your instincts take control. We are higher than that, remember? But he did not reply. To the Alpha's great shock, he got disconnected from that wolf. He pushed his telepathy harder, digging in the muddled cloud that was disrupting his tranquility. So sorry, it won't happen again. This place is clearly dangerous, I will make my leave. Good. Be sure not to disconnect again, or consequences will be severe. Inwardly, the Lone Wolf smiled. The momentary rush of thoughts and instincts he experienced was more than enough for him to undermine the Alpha's authority. He was finally free, in the smallest of ways. He would have to be very careful not to put a paw out of line, but this was a first step, at least. The two patrolling the building, on the other hand, were having trouble. One of them already had a nick in her ear from the bullets. They were hopelessly outclassed, at least in terms of long-range combat. They would have to heed the Alpha's requests to play along and practice diplomacy. The one with the Nicked Ear broke off and started following the nearest competitor, some strange being made of clay. It was currently engaged in conversation with another hairless monkey, so she made no effort to be seen, but she did not try to hide herself, either. She simply laid down, in a submissive position, and waited her turn, as Alpha told her to. On this clear, bright day, the Oracle of Meow foretold that she would go into the kitchen. She also knew she would step outside for a touch of fresh air, from the tradesman's entrance. She also knew that when she did, she would inadvertently - or perhaps purposefully, now that she knew - trigger security alarms all over the restaurant, causing the traitorous waiter on staff to panic and send the signal too early. Well, the future was slightly fractured round the edges. That would be her great secret. She would not dare tell her followers that she would see most futures - the ones closest to occurring brighter than the ones farther away up the slopes of Mount Probability, but the faraway, dim ones no less possible... It didn't bear thinking about. Besides, prophecy would hardly become an empirical science for a long time yet. It was beginning to hit her that she had no followers here. Nor would she, in the near, safe future.